Several months ago a friend posted on Facebook a picture of a chalk board on the sidewalk just outside a sandwich shop. The sign read, “Come in and try the worst meatball sandwich that one guy on Yelp ever had in his life.” The photo made me smile, and it made me think about how you and I respond to criticism we receive. Yelp is a “user review” website. After purchasing services from a local business, people post reviews of their experiences. Everything from restaurants to spas, and auto mechanics to dentists can be reviewed on Yelp. User reviews are readily accessible at other sites like Angie’s List and Epinions. Google offers reviews when you search for products or services to buy. You probably even receive an unsolicited user review once is a while from your friends and followers on Facebook and Twitter. Late last week I was reading user reviews on Amazon.com that influenced my purchase of new headset for my cell phone. Many think user reviews are a twenty-first century, internet phenomenon. You and I, people serving the church, have known about user reviews for a long time. We are reviewed after almost everything we do. Every sermon, teaching, youth event, choir performance, visitation technique, administrative skill, and everything else we do is reviewed like a scoring play in the NFL. Yelp is not required! Nor is instant replay! Criticism never feels good. As an associate or other staff member, it can be even more difficult. We have so many bosses – official and unofficial. We never know how seriously a single comment might be received by our lead pastor or supervisory committee. Some associates experience a lot of stress over a user review. 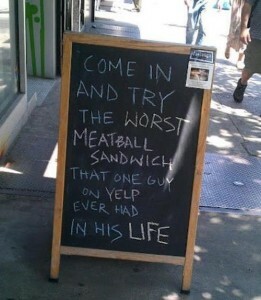 This shop-owners response to the criticism of about his or her meatball sandwich cracks me up. How do you respond to a negative review? For the next several days, I will post some thoughts on how you might better respond to your user reviews.